It’s time for the TLC over at Splitcoast, and it’s also time for the CAS challenge too! Judy’s challenge…crazy stitching and Denise’s challenge…that smells great. 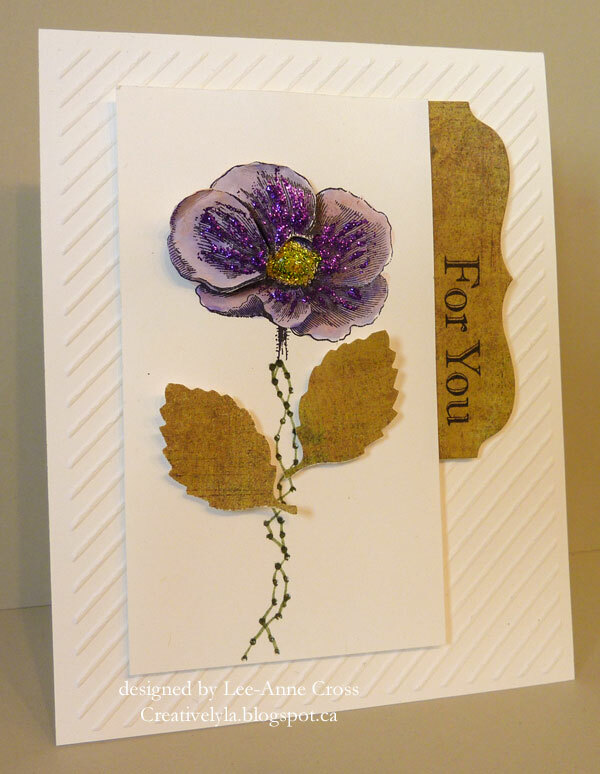 I started out by stamping my floral image once on the rectangular piece and twice again on a smaller scrap of white card stock. Using my SU! markers I colored the focal image and just the two petals that I later cut out and raised on dimensionals. I also added some extra color with my waterbrush and a Gelato, then added more dimension and sparkle with some Stickles. Hope today is the start to a great week for you my friends! Back soon with more! Gorgeous!! Love the flower and the stitched stem! A gorgeous and sparkly flower Lee-Anne! Love the stitched stem! So creative as always! !